Know what I'm doing this weekend? Nothing...isn't it glorious! I was up in the middle of the night with my sweet baby boy Thomas, who was wailing for his binky. We went cold turkey with the "sinky binky" yesterday - I was sick and tired of feeling like I was being held hostage to the little guy's need to *constantly* have a binky in his mouth AND another in his hand. Did that binky fall into that nasty mess over there? No, I didn't...I thought you did! Adding to that drama is the fact that Thomas is two and not speaking at ALL. It's time to "pull the plug" and force the issue a bit on that front. Anyway...that was my way of saying that I *earned* the right to sleep until 10 AM this morning ;-) And I was gently guided into the conscious world by the smell of buttered toast and a fresh omelet garnished with tomatoes from our garden. I ate in my jammies...in bed...surrounded by giggling babies and an adoring husband. I was confessing my fears and worries to a friend recently. She has such a firm and real grasp on God's love for her. I know it intellectually (that God loves me), but I struggle to feel it way down deep in my heart. Our conversation then switched gears and we talked about our husbands. I, of course, gushed on and on about how wonderful my amazing Luke is. Her reply (straight from Heaven, I know) was something like, "Well, the Spirit is in Luke. God loves you through Luke too, you know. Whenever you feel the outpouring of Luke's love for you...know that THAT is God's love." Hit me like a ton of bricks. In a good and overpowering and let-the-tears-come kind of way. As I enjoyed my omelet while still cozy in my jammies this morning...oh, God loves me very, very much. I'm going to have to get on the couponing bandwagon. I have a handful of friends who save hundreds of dollars in groceries and household stuff each month. I think I've pursued lots of avenues to make money, but have pretty much left the roads to saving money unexplored. We're committed (and frankly, a bit obsessed lately) with our plan to dig ourselves out of debt - we even sold Luke's Suburban (sniff, sniff) this week. It just doesn't make sense to spend hundreds of dollars each month that I could be saving us. Sigh. I don't want something new on my to-do list. But I'm going to Walmart today to buy last week's Sunday paper, and I'll go again tomorrow to buy the new one. Ahhh....and now, for what's really on my mind. My 91 year old Grandma is in the hospital with a slew of problems, and I hate it. I hate that she's suffering in any way. I hate it when she has a hangnail, for crying out loud. I hate that I can't be there for her. I hate that I can't be there for my Mom. I hate that Grandma has been lonely for a long time and wanting to "go home with Daddy (what she always called Grandpa)". I hate the thought of holding on to her. I hate the thought of letting her go. There's one thing I love though....a conversation we had years ago during which she referred to "the Lord" in such a tender voice, that I know that she must know Him. 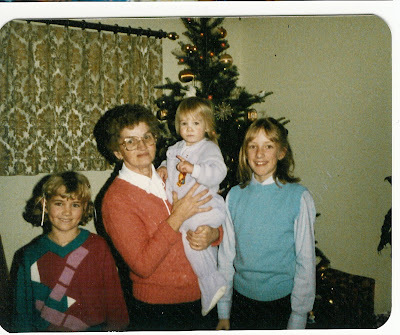 Here's a photo of taken of Grandma with me (far, buck-toothed right) and my sisters about 23 years ago. Would you pray for her, please? Just said a prayer for your Gramma. I'm sorry. I have only my gramma-in-law still left on earth. I pray both of your burdens will be light. And, thank-you a million for sharing your friend's insight. I just want to give God a big never-ending hug. Hey, come to think of it, guess I'll go hug my hubby and babies. Thanks. Thank you for taking such good care of me tonight. God loves you and so do I! Praying for all the burdens on your heart right now, especially your Grandma. Just wanted to leave a quick note. We are all worried about Grandma, but I can definitely tell you that her spirit is good. My Mom was was telling me a story yesterday about her making some of the nurses laugh. So, that made me feel better. Still follow your blog regularly...love to catch up on how all those kids are growing...They grow so fast! Thanks for doing the blog! I know I should comment more, but it really is a highlight to may day to reflect on some of your thoughts!